Asheville fiber artist Kendall White will demonstrate the wet felting process at Gallery of the Mountains on Friday, August 4 from 1 – 5pm. 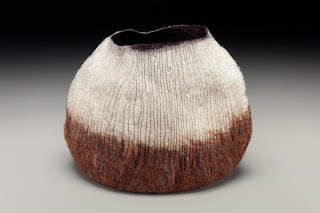 Several of her sculptural wool baskets, inspired by the traditional native pottery of the Southwest, will be on display and available to purchase as well as her felted merino wool neck wraps. Kendall White began her exploration in fiber art at a very early age. She was often recruited to help her grandmother, a quilter, in piecing and cutting together fabric. In 2005 Kendall moved to Smithville, TN to pursue her BFA in fiber arts at the Appalachian Center for Craft. There she explored weaving, spinning, dyeing, and printmaking, but it was a workshop at the John C. Campbell Folk School in 2008 that would open her eyes to one of the oldest form of textile creation, felting. Kendall has since been dedicated to perfecting her craft while continually searching for new methods for creation. Her work can be found at the Georgia O’Keefe Museum Store and at Gallery of the Mountains in Asheville.